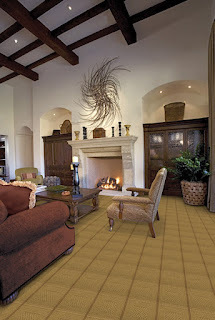 Carpet is always a popular flooring choice in Indianapolis area homes. And no wonder! It is quick to install, easy to care for and comes in a wide variety of options suitable for any room of your house. Have a high traffic area? Highly twisted yarns will hold their shape better. Look for loop pile, cut loop pile, frieze or Berber styles. Looking for a casual touch? Cut pile, cut loop and shag carpets lend themselves nicely to a room with a fun, active atmosphere. Need a more formal design? Saxony or velvet carpets will give your room a soft, lush look and feel. Come visit Kermans in Castleton and ask to speak to one of our design experts. They are working the showroom and offer their knowledge free of charge - yes free! They'll be happy to show you the different types of carpet so you can literally "get a feel" for it. They'll talk to you about wear patterns and high traffic needs and more. Buying carpet is a long-term investment and you don't have to do it alone. You might want to do some homework on your own first. That's where our online carpet buyer's guide can help. It talks about different carpet styles, things to ask before you buy carpet, an installation guide and more. Armed with knowledge, you are now ready to carpet your home with confidence!